In this post I’d like to state something that I’ve just recalled from a Greg Young’s video. When I started creating an aggregate root I often ask myself… where do I put this logic? where do I have to set these properties? Is the Command or the Domain Event Handler responsible? As we know, an aggregate root can be considered a boundary for a relevant business case. The public interface of an aggregate exposes behaviours and raises events. 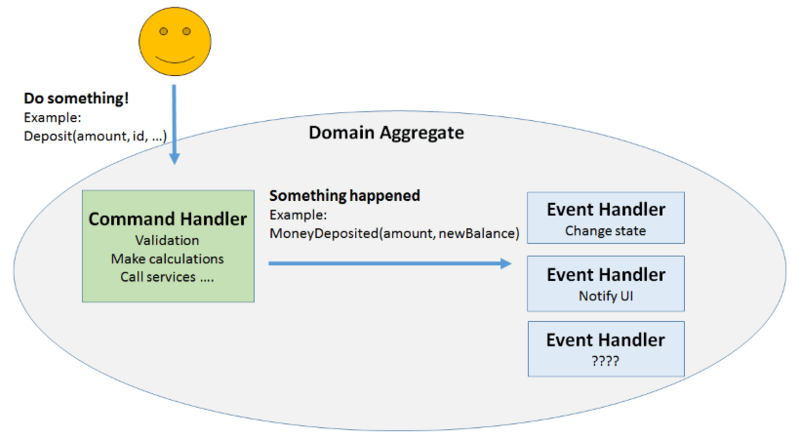 With this in mind, when we design an aggregate root, we start adding behaviours/commands to it and then apply events. The following is a list of what a Command and a Domain-Event handler can and cannot do. It behaves like a guard against wrong changes. They apply the required changes of the state. No validation, no exceptions, no logic. For example, if we have a command handler method called Deposit that receives an amount of money and updates the balance, we can implement a simple algorithm in the method and raises an event MoneyDeposited with the result of the calculation and any other information that we want to keep stored in our event store.